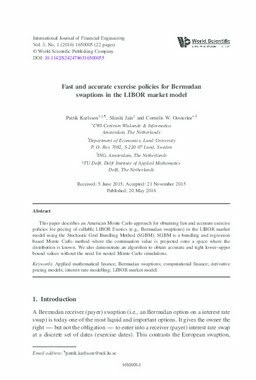 This paper describes an American Monte Carlo approach for obtaining fast and accurate exercise policies for pricing of callable LIBOR Exotics (e.g., Bermudan swaptions) in the LIBOR market model using the Stochastic Grid Bundling Method (SGBM). SGBM is a bundling and regression based Monte Carlo method where the continuation value is projected onto a space where the distribution is known. We also demonstrate an algorithm to obtain accurate and tight lower–upper bound values without the need for nested Monte Carlo simulations.